Following 2nd place for a national business award and a string of appearances at Food Festivals and Community events, Katharine Tate, The Food Teacher, has just released her first two books. 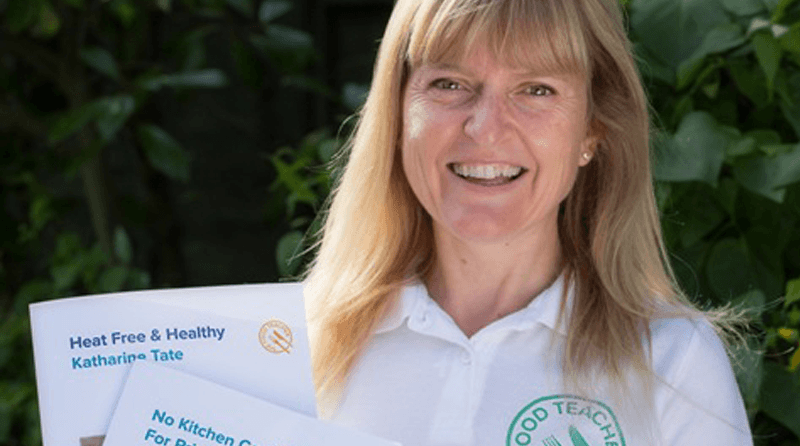 The Food Teacher, Katharine Tate, lives in Hertfordshire and is a qualified teacher and award winning registered nutritional therapist. Following the success of her work in schools, a series of community talks and demos, and the ever-increasing popularity of her Facebook page, she has just released her first two books. ‘No Kitchen Cookery for Primary Schools’ was created after Katharine discovered many Primary Schools in the UK no longer have access to a school kitchen or cookery space. With the return of cooking and nutrition to the school curriculum in 2014, this innovative book provides teachers with an outline for cookery lessons that meet the curriculum requirements, but can be delivered within the classroom. In addition to providing straightforward easy to follow recipes for teachers and pupils, the book also includes detailed lesson objectives, outcomes and assessment opportunities. Additional “nutrition know how” sections on each recipe helps pupils learn a little more about what they are preparing and how it is beneficial for the body. The companion book, ‘Heat-Free and Healthy’ illustrates how both adults and children can create simple, nutritious food at home without using a cooker. These are both available at Food Teacher events, direct from her website and Amazon. The release of her two books illustrates her growing motivation and desire to educate and support people to understand more about the importance of food and wellbeing. They also appeal to a wide audience with requests from nurseries, playgroups, scout/guide groups and cookery schools looking for straightforward, healthy recipes that can be created with minimal equipment and mess. Katharine also runs a busy clinic working with both adult and child clients to support their health and address health conditions. To find out more about her work or to contact her visit her website: www.thefoodteacher.co.uk, sign up for updates and news or follow The Food Teacher on Facebook or Twitter.